Chemists spend a great deal of time and energy trying to get chemical reactions to begin or to speed up — but sometimes it can be just as important to stop them before they go too far. 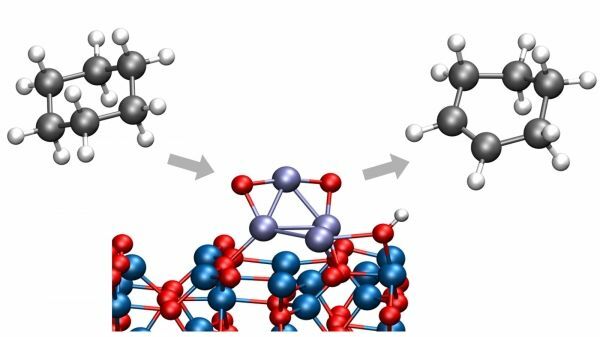 In a recent study from the U.S. Department of Energy’s (DOE) Argonne National Laboratory, chemists have identified a way to convert cyclohexane to cyclohexene or cyclohexadiene, important chemicals in a wide range of industrial processes. Importantly, this process takes place at low temperatures, eliminating the creation of carbon dioxide that would have resulted from an unwanted breaking of carbon-carbon bonds. Cyclohexane is an important starting molecule in a wide range of chemical reactions, according to Argonne chemist Stefan Vajda, now at the J. Heyrovský Institute of Physical Chemistry in Prague. However, without a suitable catalyst to initiate the reaction, converting cyclohexane into useful products typically requires elevated temperatures generated through the expenditure of a great deal of energy, and the process may suffer from poor selectivity as well.